Contact Ron Antonucci with questions about the Sports Research Center. Browse a portion of our collection online in our Digital Gallery including interviews with retired pro baseball players from Dr. Eugene Murdock. We also host the Cleveland Sports Icon Interviews conducted by Dan Coughlin and League Park Legacy in collaboration with the Baseball Heritage Museum. The Sports Icon Interview Series is an oral history project designed to preserve the history of the people who made Cleveland sports great. Dan Coughlin (long-time Cleveland journalist, sportscaster, and icon in his own right) conducted the interviews in his inimitable style, allowing the icons to tell their stories in their own words. A number of the interviews are in video format with the remainder available as audio. Access over 40 interviews in the series on Cleveland Public Library’s Digital Gallery. 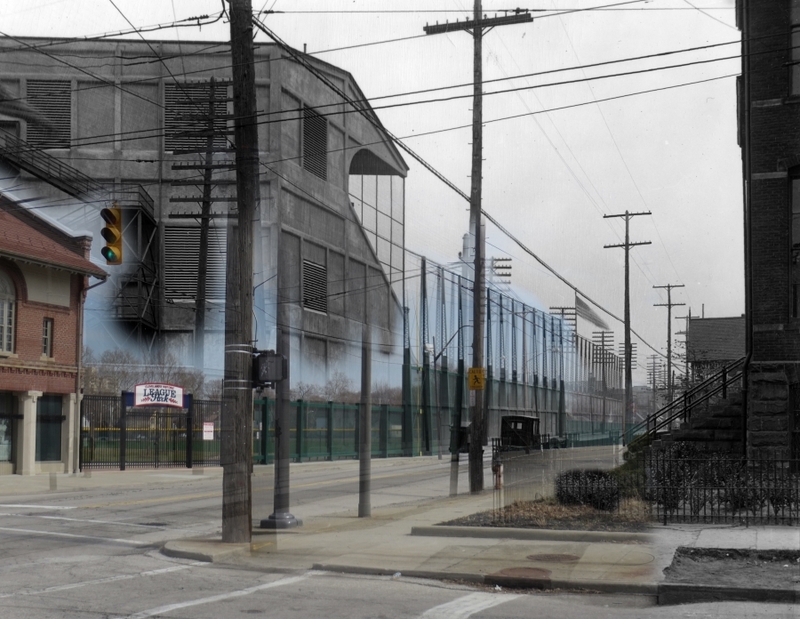 Baseball history comes alive at Cleveland’s historical ballpark, League Park, located on Lexington Avenue between E 66th and E 70th Streets in the Hough neighborhood. Built in 1891 and also known as Dunn Field at one time, League Park is “baseball’s oldest existing Major League ball grounds.” The restored Ticket House (seen in the lower left in the aerial view below) is home to the Baseball Heritage Museum. View an image of the current League Park superimposed over a black-and-white photo of the League Park of the past, click here. This provides a visual reminder of how the new fence and refurbished Ticket House relate to the original structure. The view is from the corner of East 66th and Lexington Avenue looking east down Lexington. Photo credits: Photograph Collection, Cleveland Public Library, except: Cleveland Aerial Media, City Architecture (League Park today); The Cleveland Press Collection, Michael Schwartz Library, Cleveland State University (Ruth and Gehrig at League Park, 1927); Raymond Hisrich, Ragersville Historical Society (Alta Weiss, 1907); Library of Congress, Prints & Photographs Division, Detroit Publishing Company Collection. (League Park, Cleveland, Ohio, between 1900 and 1910).